Tricera Coffee is the the brainchild of Robbie Dietrich, one of the minds behind Charleston Cup Coffee. He and his wife run this cozy little George St coffee shop that caters mostly to CofC students and the occasional tourist. I asked about the dinosaur theme -- “were you obsessed with dinosaurs as a kid?” -- and Robbie said it was a joke of an idea he and his sister had while coming up with names for the coffee business. He didn't start collecting the triceratops paraphernalia until after they decided on the name (which they picked because “although it's short for ‘triceratops,’ to the unsuspecting passerby, it could be something mysterious and Italian”). Once school starts back up again, Tricera will re-introduce its Friday & Saturday late-night menu, featuring delicious options like the loaded magma fries, the midnight breakfast sandwich, and a kale & cheese griller (if you want to splurge but also be healthy). But the shining star is the donut burger: two grilled Krispy Kreme donuts, 100% fern-fed Triceratops meat (aka grass-fed beef), American cheese, and blackberry-red wine reduction. Full disclosure: I added bacon to mine, because why not? 1. 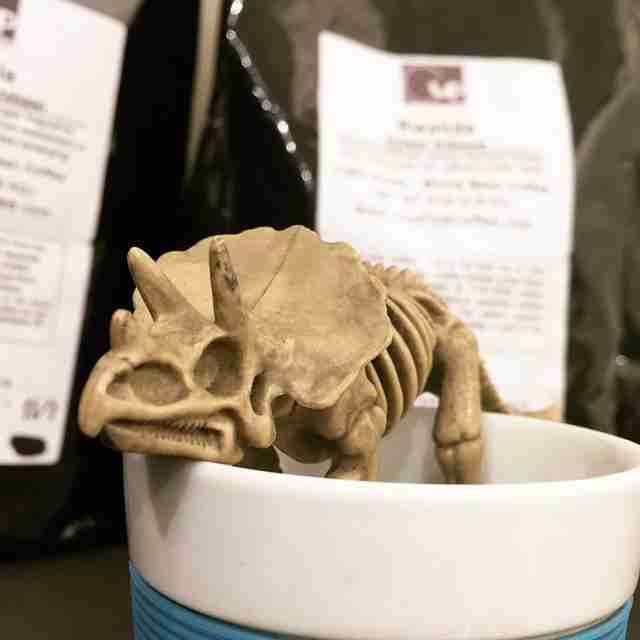 A dinosaur-themed coffee shop is the coolest. 2. This makes me think of when I was a little kid and my brother and I would play Godzilla vs Power Rangers. Why hasn't anyone made that a movie yet? 3. I don't think I have enough napkins. Will anyone judge me if I bring the whole napkin dispenser over to my table? Whatever, I'm doing it anyway. 4. Does diabetes run in my family? I feel like I probably should've checked on that before deciding to eat this. 5. Am I ready for all this jelly? I’m not sure. 6. Jim Gaffigan would be so proud of me right now. 7. This looks even better than I pictured it in my head. 8. I didn't realize the donuts were Krispy Kreme until this moment, and now I'm triple-excited. 9. I'm not 100% positive, but I'm pretty sure I heard a chorus of angels harmonizing just now. 10. This sauce is amazing. Also, very messy. 11. I feel like a T. rex right now mauling this burger. 12. The donuts have immediately deflated. I don't know my own strength. 13. 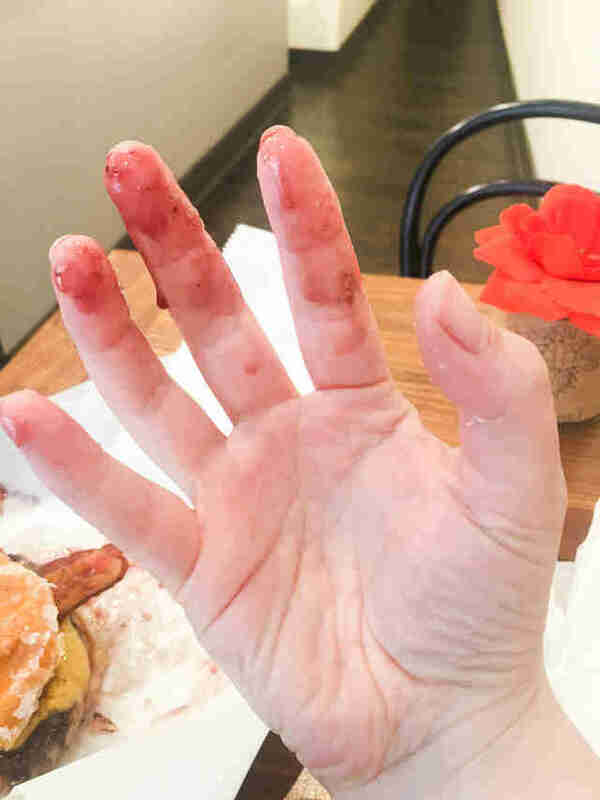 This blackberry-red wine sauce running down my hands makes me look like a murderer. I don't really taste the red wine, though. I think it's more blackberry. [licks fingers] Oh no, wait. I definitely taste the red wine now. They should bottle this sauce, it’s amazing. 14. Bacon was a good choice. 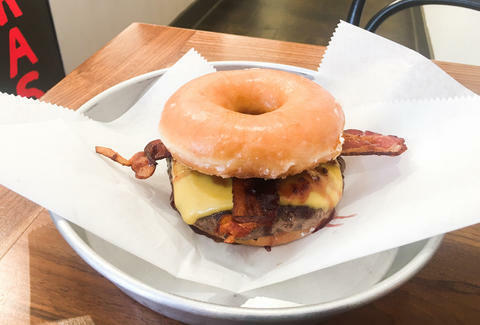 The smoky bacon is perfect with the sweetness of the donuts. 15. I just got donut glaze on my pants, and at first glance it does not look like donut glaze. 16. It's good that I'm not still in college, because I'd want to eat this every Friday night. 17. This burger should come with complimentary wet-naps. I'm a mess. 18. Is it bad that I kind of want another one? OK, I won't lie: the donut burger is intense, filling, and a beast of a burger. But overall, I'll definitely be getting another one of these come August. You should, too. Sydney Gallimore is a food writer eating her way through Charleston, SC. Follow along at @Sydney_Inc.